If you accidentally deleted a voicemail on an iPhone, you can usually retrieve these messages by looking through a somewhat unknown “Deleted Messages” list that is part of the Phone app in iOS. Though this feature is little known, it’s quite easy to use, and if you’re hoping to find old or deleted voicemails on the iPhone this is the first place you should look. It doesn’t matter what version of iOS the iPhone is running, so long as the iPhone supports visual voicemail they can be possibly found here. The iPhone will actually store all deleted voicemails in this list as long as you haven’t gone through here before and selected “Clear All” – which permanently trashes all deleted messages – making it fairly easy to recover voicemail that you’ve deleted from the main messages list. Again, it’s important to mention that directory isn’t available to users without using a third party tool, or without using ftp to access a jailbroken iPhone. The messages are also contained within the standard iPhone backup which is stored locally on the synced computer, but they’re not easily read or listened to since they are contained within database files much like the SMS files. Advanced users can still extract the files, however. I’ve had an iPhone since they first came out, but I wasn’t aware of this feature until @atinirao mentioned it in a tweet. Great tip! Not much point in deleting voicemail if they’re just going to be kept anyway! Scroll down to. Have I missed something? You have to have Visible Voicemail activated. where di i get this visible voicemail activated? Do you really consider this a “Tip” or “Trick?” Anyone who has ever listened to a voicemail on their iPhone surely saw “Deleted Messages” and knew right away what it was. If they didn’t, they need to go back to a flip phone. i/m sorry but I have to ask, Why not just simply answer the question. We are not all required to be telephone geniouses just to own one. It was a guy looking for a legitimate answer not an insult for not being a super nerd. the author of this article must be a Verizon subscriber to have only recently discovered this “hidden” feature. i know for certain it has been around since the iPhone 3G in 2008 and was probably the same on the 2007 iphone. next up on osx daily, how to turn on your mac!! minsterkermy are you trying to say that osx daily publish useless articles ?? I guess so ,anyways nice joke !! Cool, I didn’t know this either. Thank you, thank you, a million times thank you….so simple but I could not find it! 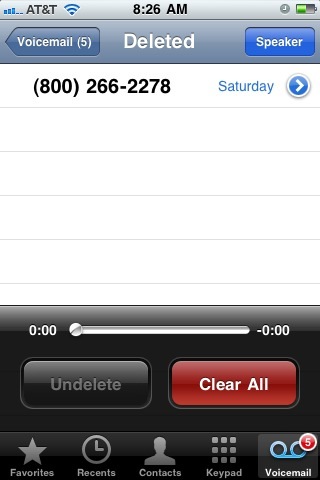 Is there a way to insure your deleted voice mails stay deleted? So if you clear all by accident all voicemails are gone forever? Right?